The software used to run Merchants' Village is now available to manage consignment sale operations in your retail store, flea market, antique mall, pawn shop, thrift store, auction house, jewelry store, or other similar establishment. The Merchants' Village consignment system is uniquely fast and flexible, and the fully functional system is now available completely for free, to use in your commercial location (released under the GPL3 open source license). The Merchants' Village software makes use of a simple bar code system that allows accepted vendors (any individual or company) to quickly print out labels for items they want to sell on consignment. 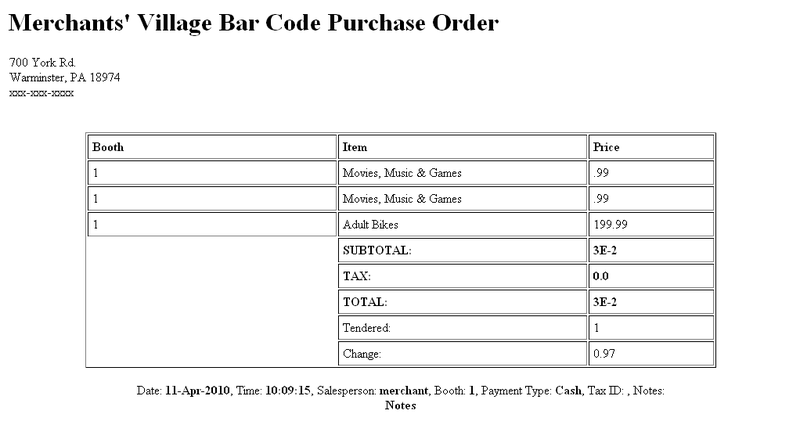 Customers can then shop the labeled items, and the retail shop/mall can process sales transactions by scanning bar codes on the consigned items, using the included cash register checkout ("POS") screen. It works just like the checkout at any big box retail store. Vendors do not have to be involved with the point of sale transaction at any point. Consignors simply tag and stock their items for sale, and display them as agreed, for the store operators to scan and sell. 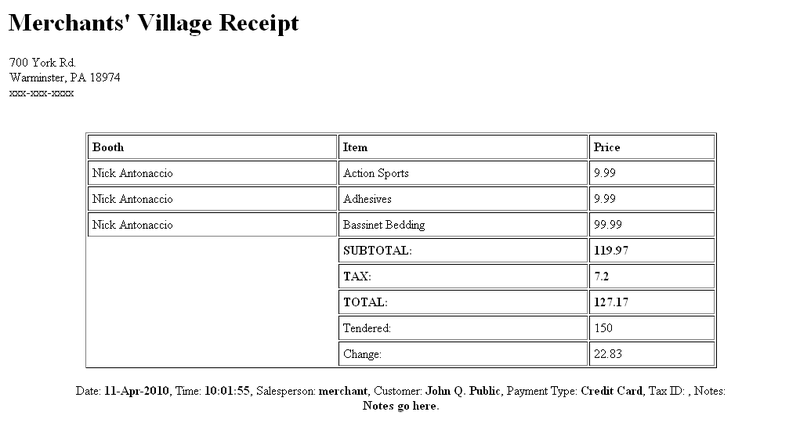 The software tracks and reports on sales of every item. Vendors can check instant reports of all their own items sold during any time period, from any location, using a simple automated web form online. Batch reports can be printed by the shop/mall owner for any time period (weekly, biweekly, etc), and batch checks can be printed for all sales made for each vendor. It's an all inclusive fully automated system, that saves time, energy, money, and frustration for shop owners, vendors, and customers, during every step of the process. The system is designed to be far more versatile than standard POS systems, made to manage complex, high volume consignment sale operations. But you can also use it as a straight forward cash register system in any typical retail environment, whether or not consignment sales are a part of the checkout process. The Merchants' Village software has been proven to comfortably handle 10's of thousands of sales transactions per week. The prototype of the design was used commercially in several busy locations for more than a decade, and the currently available version was tested in use for 2 1/2 additional years, 7 days a week, in one of highest volume consignment environments anywhere, managing sales transactions in a 120,000 square foot retail center, containing millions of items, and handling thousands of customer transactions every week, under the constant detailed scrutiny of several hundred commercial consignors, with 100% operational success. You can watch a video about Merchants' Village operations here (check on the merchantsvillage.com home page for more videos and information about the operation). The software has been used to sell millions of items. The author charges for customization, installation, and support services, as needed, but the basic system is completely free to use, as is, for commercial purposes. 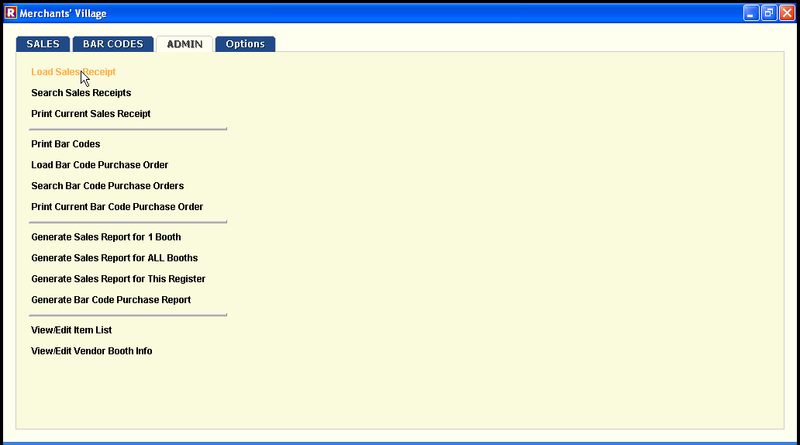 The software comes with absolutely no free support, but comprehensive paid options are available. If you want to change anything about how the program works, everything about the software - its looks, features and capabilities - are all completely customizable, to fit your specific needs. 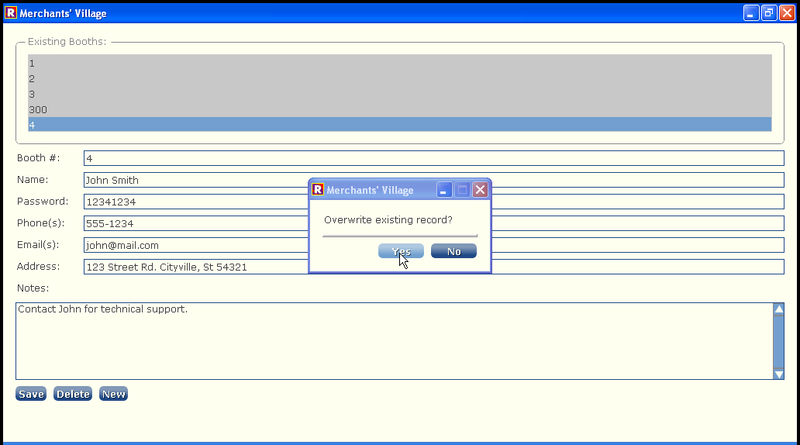 Unlike other boxed consignment programs on the market, the Merchants' Village software was developed from the ground up by a single developer, who was also an owner and operator of one of the largest consignment locations in the US (see Nick Antonaccio). If you buy support for the Merchants' Village software, you get the direct cell phone number and personal support of the person who not only wrote the code, but who also relied on the program to manage every facet of his own daily business operations, and those of thousands of clients over the years. The help available from the developer is unique among "tech support" offerings by other software manufacturers. 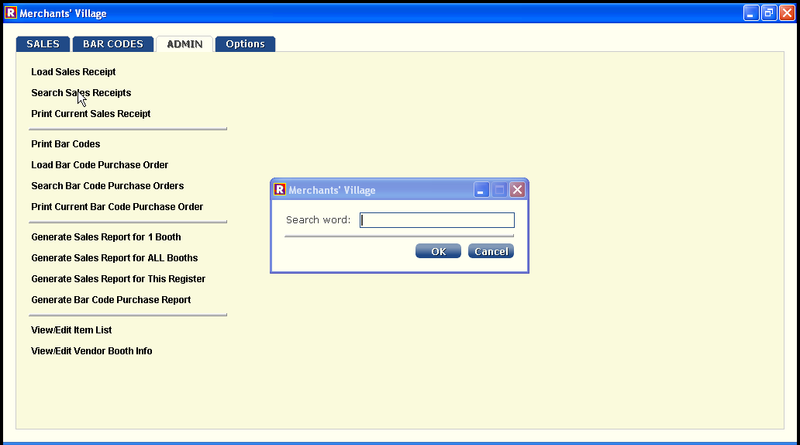 For those who don't want or need help getting started, the Merchants' Village software is provided entirely for free, with the hope that an open community driven software project will produce to best and most useful POS/consignment software available anywhere. 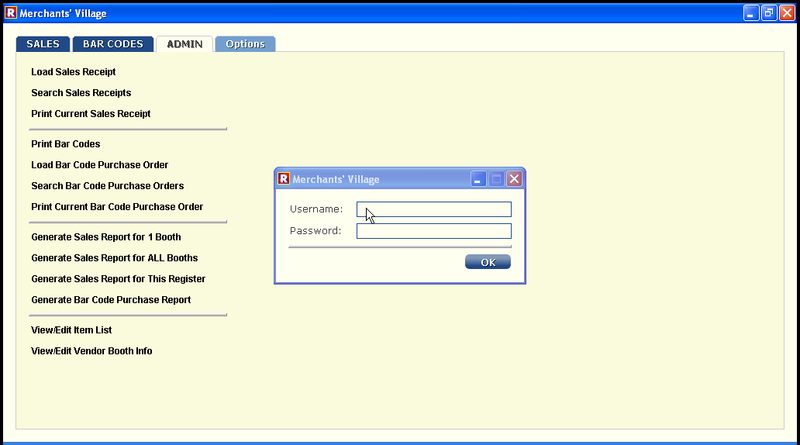 No special hardware is required to run the Merchants' Village software system. Most POS software distributors make their real money by selling proprietary thermal label paper, receipt paper, ink, printers, scanners, and other hardware which permanently lock you into buying costly supplies and services from them. The system at Merchants' Village has managed millions of sales transactions using only inexpensive netbook computers, normal plain paper printers, generic Avery-style label paper, and common place CCD bar code scanners. All these items are readily available at any office supply store, even in most Walmart stores. Installing, buying supplies, replacing worn out or broken hardware, and maintaining the system is more straightforward and cost effective than with any other consignment software on the market. With a base price of $0, open source code which can be adjusted/tweaked as needed by those with the technical savvy, and optional personal support, training, consultation, and customization services, available directly from the sole software developer, at extremely reasonable rates, you will not find a more practical solution to enable and improve productivity, help grow sales volume, and cut operational costs at your facility. Test other commercial consignment programs, and you'll find that in real use, many of the core activities are complex and excruciatingly time consuming to operate when your store is busy. The primary goal of the Merchants' Village program is to dramatically improve performance and therefore eliminate time consuming labor. The entire system can be manned comfortably by a single operator, or it can be operated simultaneously by as many checkout clerks, managers, etc., as are needed to handle high volumes of traffic. During busy periods, Merchants' Village regularly experienced as many as 6 cash registers operating simultaneously, with thousands of items being rung up per hour. The developer has worked "in the trenches" for more than 20 years, manning cash register, point of sale, reporting, and inventory operations in retail, consignment, and other business environments. The result is a truly unique and effective software product that works quickly and easily, even in the most demanding retail environments. 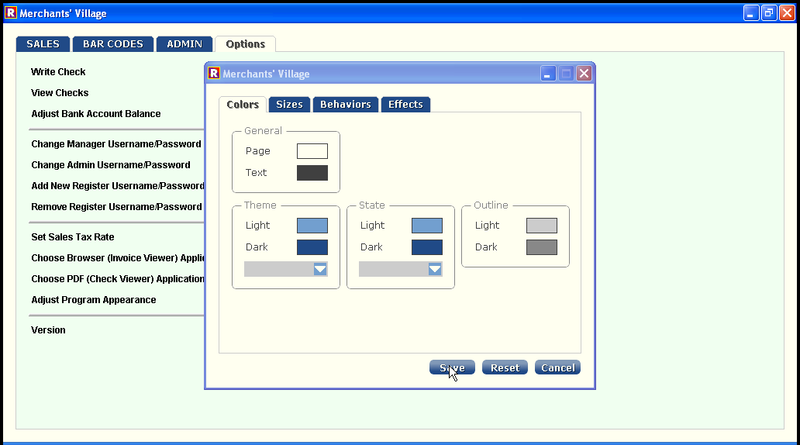 The Merchants' Village software is made to be used by operators without any special computing experience. If you can use a keyboard and mouse, and are familiar with turning on a PC, running programs, opening/closing windows, etc., you'll find that it's dead simple and fast to use. Vendors also need absolutely no special computer experience to create labels for their products. The complicated and extremely time consuming inventory entry process used in every other consignment software product on the market has been thoroughly eliminated in the Merchants' Village program. At Merchants' Village, even vendors with little to no computer skill were able to quickly order labels for thousands of varied consignment items, typically in just a few minutes. Every other software product on the market requires painstaking detailed entry of every individual item, before any sales can be made - a process which can take hours for small inventories, or weeks of dedicated work for vendors with large inventories. During an especially busy period, Merchants' Village printed bar code labels for more than 1/2 million newly stocked items, in 2 days, all using extremely fast manual entry by untrained vendors (that is, without requiring imported inventory database files that existed previously). For vendors who do have existing computerized inventory files, converting and importing label info takes just a few minutes. 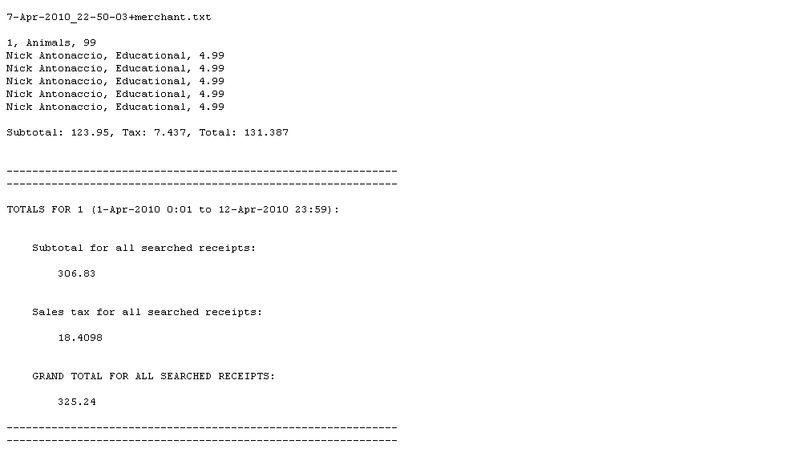 Vendor Reports: Vendors can easily check their sales online at any time. 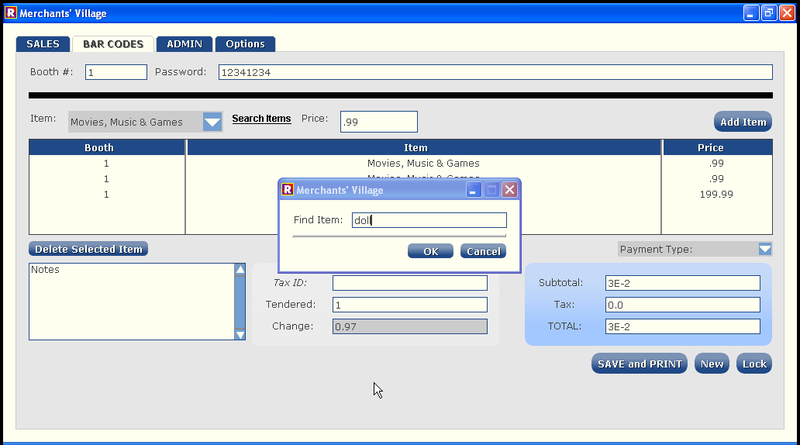 The software has a web component that allows vendors to log in with their username and password, select the start date and end date, and see all sales which have occurred during any time period, with totals, sales tax totals, dates, times, receipt numbers, names of the clerks who made the sale of every individual item, etc. Sales Events: If consignors want to run a reduced price sale on all their items, any specific items, specific item prices, or any other combination of parameters (for example, only on given days and/or given times), the system can be easily programmed to automatically ring up reduced prices, percentage discounts, or any other discounts based upon the chosen parameters, in any way that is needed. 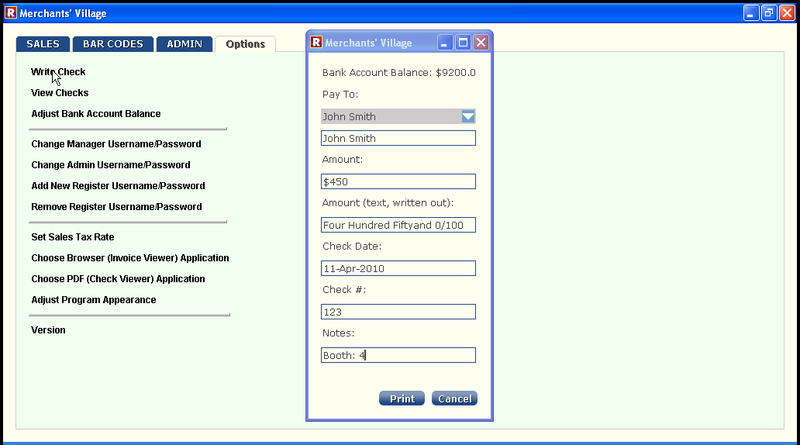 Rent and/or Commissions: If you charge consignors a rental fee for space in your establishment, the Merchants' Village software will help you keep track of rent due, payments made, etc. Reports that automatically calculate commission fees based on any individual consignor agreement, specific items, or any other custom parameters, can be programmed as needed. 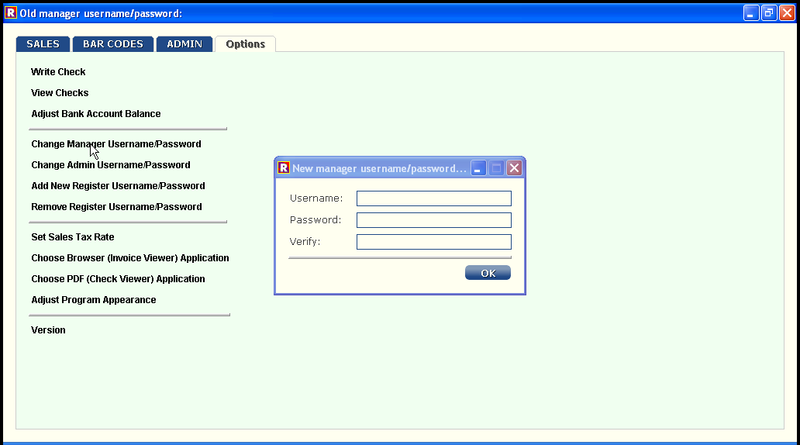 Admin Controls: The administrator interface has several levels of password control, so that only certain users can access manager features such as check writing, vendor creation and data entry, account control, etc. There are features such as note delivery, so that employees see important news and announcements every time they log in. Administrators can search for and report on information in every conceivable way, and custom reports of any complexity, on any set or subset of data, can be developed quickly, as needed in your operation. 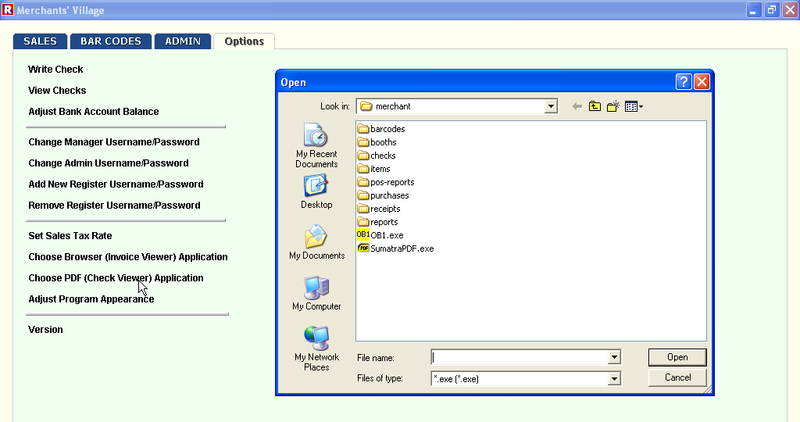 Backup: Full backup features are included to prevent data loss. Sales receipts, vendor contact info, printed checks, barcode order details, and all other essential data can be backed up locally to removable media and/or to remote servers, to your web site, etc., automatically after any chosen repeating time period, and/or manually, as desired. Payments: Owners have additional control capabilities such as viewing, approving, and digitally signing batches of checks to be printed, even when away from the office, using any desktop PC, mobile phone, or other Internet device. Employees, accountants, etc. 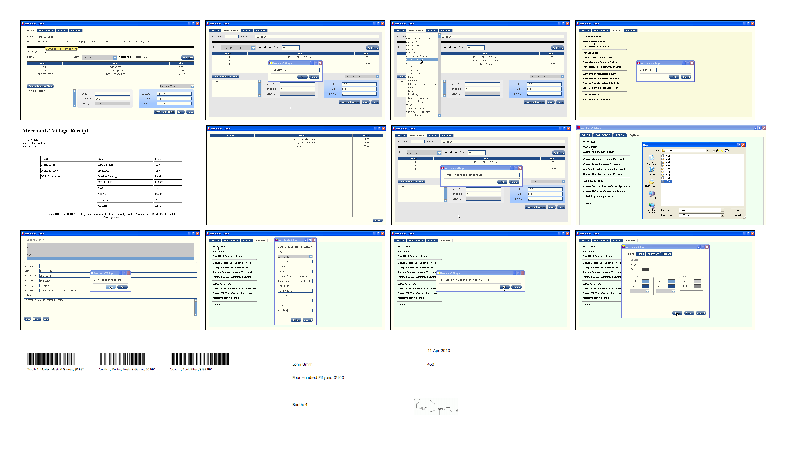 can fill out checks in the office, but can only print them when the owner or other approved party has viewed and signed them (that process is instant, even for check batches of any size). Many thousands of checks totaling millions of dollars have been issued using this simple online approval system. A single Merchants' Village employee was able to print batches of hundreds of checks in just a couple hours every 2 weeks, without the owner ever needing to be present in the office, and daily cell phone approvals enabled routine financial transactions, with a freedom that most business owners only dream of. Sub Contractor Support: Out of the box, the system can be used to handle accounts receivable, payment histories, and collections from vendors who rent space at your facility. It can even be used to keep track of sales by sub-contractor consignment groups who want to rent space and sell consignment items for others, in your store, even if all sales go only through your cash registers. 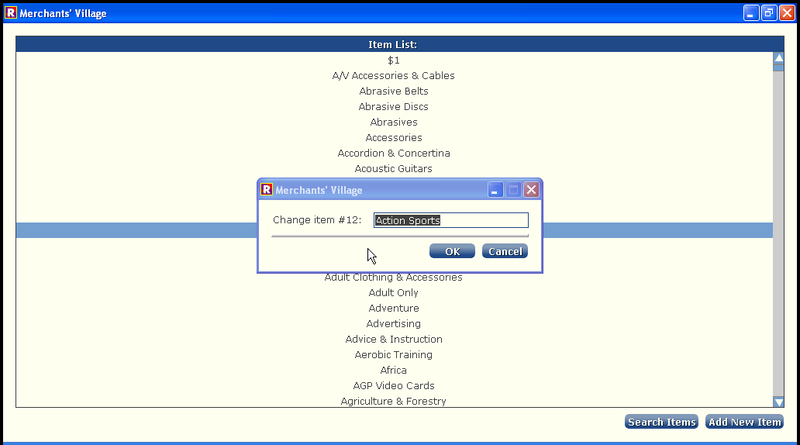 For example, if your clients want to operate their own consignment space within your mall, flea market, store, etc., without having to run their own POS software or sales tracking system - the Merchants' Village software will do it all for them, and for you, without requiring your client to ever to be present to manage sales or tracking of their sub-consigned items. Floor Map: A simple mapping component allows you to mark where items from particular consignors are found on your floor plan image. Time Clock: An existing component handles employee time clock tracking and optionally allows automated submission to Paychecks.com payroll services. At Merchants' Village, weekly payroll for 29 employees required less than 5 minutes to organize and submit. Extras: A number of extra utilities such as a batch web site image uploader to send consignor images to your web site, an special form that vendors can use to submit item suggestions to simplify organization of group ads in newpapers, print, etc., and many other practical software helpers, are included. Add-Ons: Additional modules are available to handle employee scheduling, web site building and maintenance, group emailing to vendors and customers, and other common critical business needs (add-ons that are not part of the main system are not free). Because the main program code is open source, any capable developer can create custom add-on features (or they can be developed quickly by the author at very reasonable rates). Because this system was born from years of challenging personal experience and busy daily use, by a single developer who was also the main user of the software and manager of the people who operated it, it's features are made to be realistically usable and practical. Every common routine has been reduced to the fewest possible display screens, human movements, keystrokes, mouse clicks, bar code scans, etc. Checks for potential human error have been anticipated, experienced, and handled in the smoothest and most intuitive ways possible. More than 100 employees have been trained to use the system, and new employees with only minimal computer experience were regularly able to operate the cash register and pricing systems after a single day of training. More than 2000 vendors have learned to use the label ordering system, and it typically takes just a few minutes for them to learn to submit completed orders. At Merchants' Village the software always ran on MS Windows computers, but it is designed to run on any version of Windows, Mac, Linux, FreeBSD, OpenBD, and other OS platforms, with absolutely no changes whatsoever to the code. The software runs entirely in a language interpreter called Rebol, and does not require any other database system, drivers, plugins, or unusual supporting software or hardware of any type. 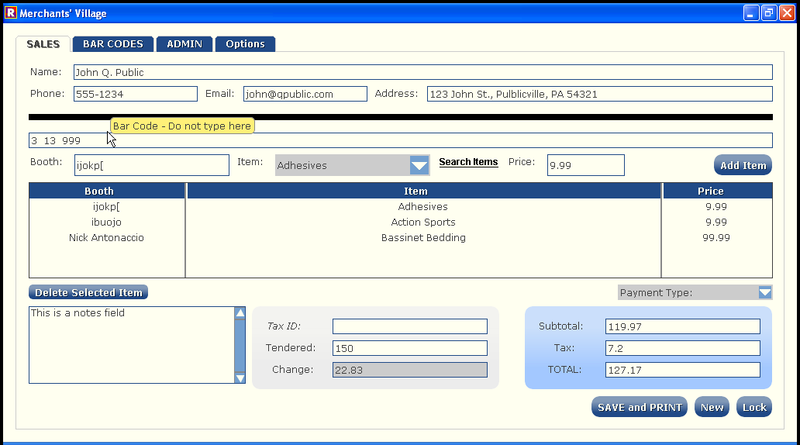 Label and receipt printing is handled by any available web browser and PDF reader. 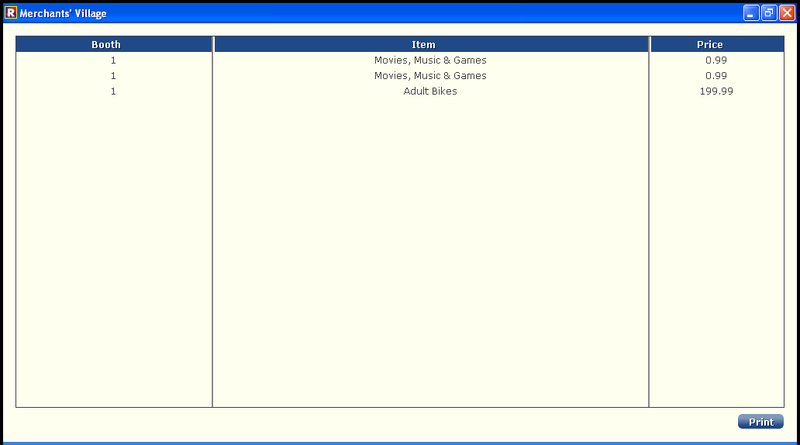 Anything about the program can be modified as needed for your specific purposes. 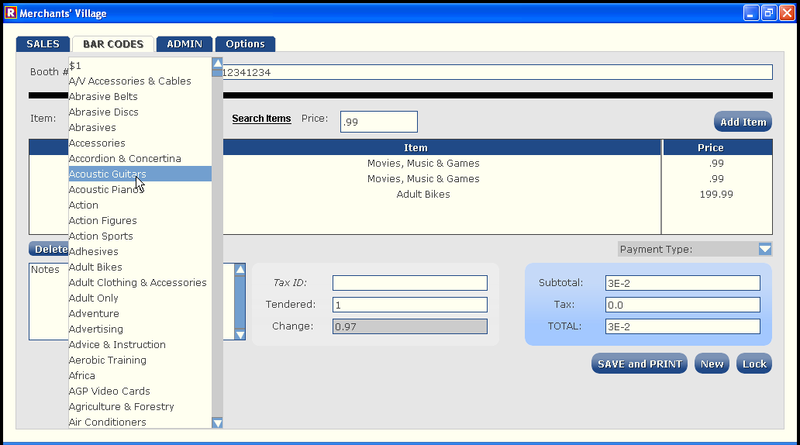 If you need a button or menu added to the POS screen to handle special calculations, if you want the system to generate reports which automatically calculate fees for specific sales criteria (payment types, specific items, specific vendors, or any other data field), if you want to automatically compute special discounts for items sold by specific vendors, on specific dates, etc. 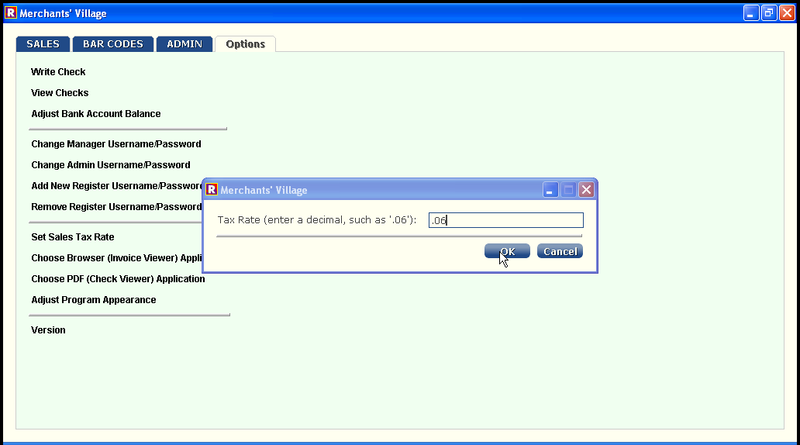 - those or any other special custom options are possible, and can all be made as needed by capable developers. If you're not a developer, changes can be implemented personally and quickly by the author - a single experienced developer who not only wrote the code, but who also understands the "real life" challenges of your business. The Merchants' Village software was not created by a team of coders sitting in cubicles at a commercial software company who haven't ever stood at a register, managed employees, handled irate customers, etc. The developer of this software knows exactly what it means to deal with vendors who constantly want to scrutinize what's been sold, and customers who want to see professional looking price labels on every item, to check out quickly, and to experience the same type of purchasing routine they're used to at other mainstream retail stores. 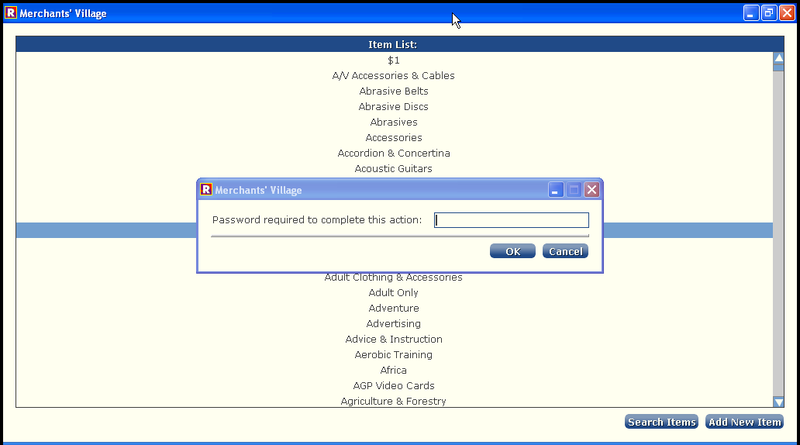 The Merchants' Village software looks professional, but it's not the flashiest piece of consignment software on the market. Other commercial offerings may look pretty, but you will not find the same real life ease-of-use features in any other consignment software, anywhere. And if you need any unique feature added or changed to handle specialized situations, just ask the developer. The developer has spent decades watching business owners unknowingly invest in inappropriate canned commercial software, hardware, supplies, long term service contracts, etc. for expensive systems that appeared powerful and feature packed, but were just not a good fit for their operational requirements. Software companies know that their customers buy products because they look good, but deep menus full of complex options, data input screens filled with graphics, and convincing marketing materials do not equate to efficient usability for your business. Simple custom designed systems work best. Don't get burnt buying a system that doesn't do exactly what you want, or which wasn't made to operate quickly and effectively for your specific needs. The purpose of the Merchants' Village software, along with the option to make any changes that your use requires, is to make your business operate as efficiently and cost effectively as possible. No boxed commercial product can provide such flexible capabilities or finely detailed options, to help enable the business routine that you imagine. At the bottom of this page are a few screen shots of the basic Merchants' Village system. If you'd like a free consultation to discuss any sort of custom software development for your specific needs, or if you have any questions at all, call Nick at 570-891-1972 or email software@merchantsvillage.com. Before spending any money or committing any effort to testing software, you can take your time to speak directly with the developer, ask questions, discuss your needs, and figure out if the Merchants' Village software may be the right fit for your situation. If not, you will never be contacted with sales calls, and your information will be kept completely private. After the initial free consultation, the author's standard work rate is $50 per hour, but contract support rates are available, and all special project costs are quoted before any work is started, so you always know exactly what to expect. Read the included INSTRUCTIONS.txt file for installation and operating instructions. Remember, the software is completely free to use and modify, but you do so entirely at your own risk, and there is absolutely no free support (no free installation help, no free training, no free troubleshooting, no free coding help, no free general business help, etc.) offered by the author. If you are considering starting a new consignment operation, or if you're just curious about starting a new business in general, you may be interested in reading this article to get a sense of the organizational requirements. Call 570-891-1972 or email if you have any questions. Copyright © 2010 Merchant's Village. All rights reserved.